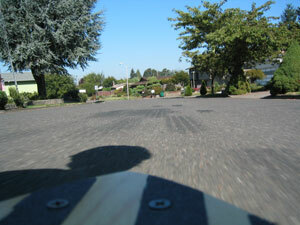 New longboard shape recently completed. 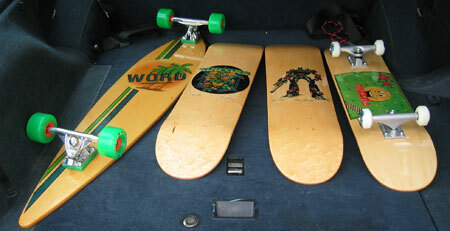 We now offer 3 different longboards and 2 different short boards. The new graphics are near. In the meantime here's a pic of our improved current graphics on our original PII shape. 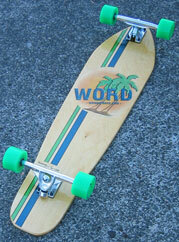 We'll post a pic of one of the pintails with graphics soon too. 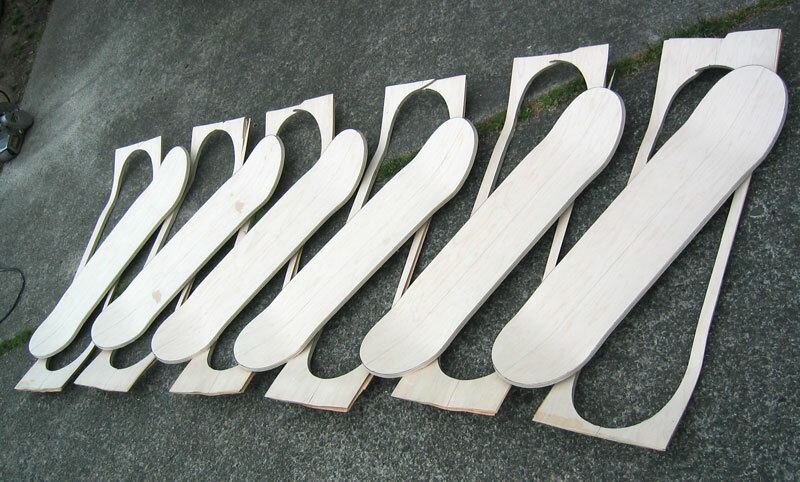 We will be coming out with some short boards fairly soon as well. 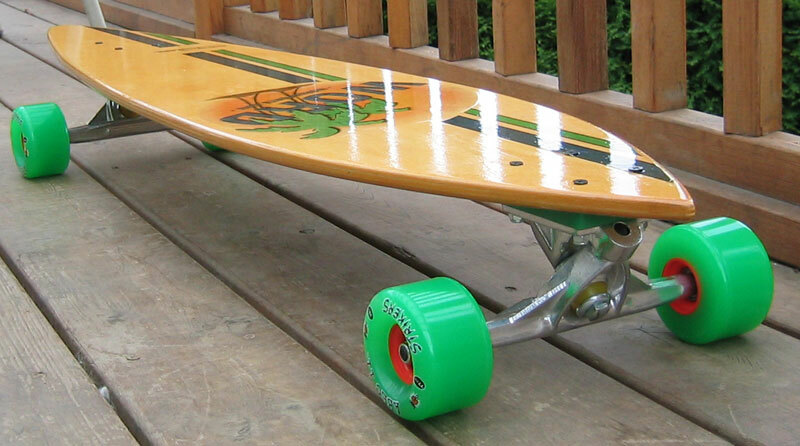 We now have a new Pintail design - 45" long, 9-1/2" wide, 31" wheelbase. More details and pictures coming soon. New graphics coming soon too!!! We have completed testing on Prototype II (literally hundreds of miles!). After testing we decided to move the rear trucks back 1" to increase high speed stability yet still retain a good turning radius. Production begins this month. The production model will have the top stained to match the bottom. Length 38", Width 9-3/8", Wheelbase 28.5" axle to axle (originally 27.5", as shown in picture). A multi-purpose board. Use for carving, cruising, downhill bombing, even giant slalom and commuting. 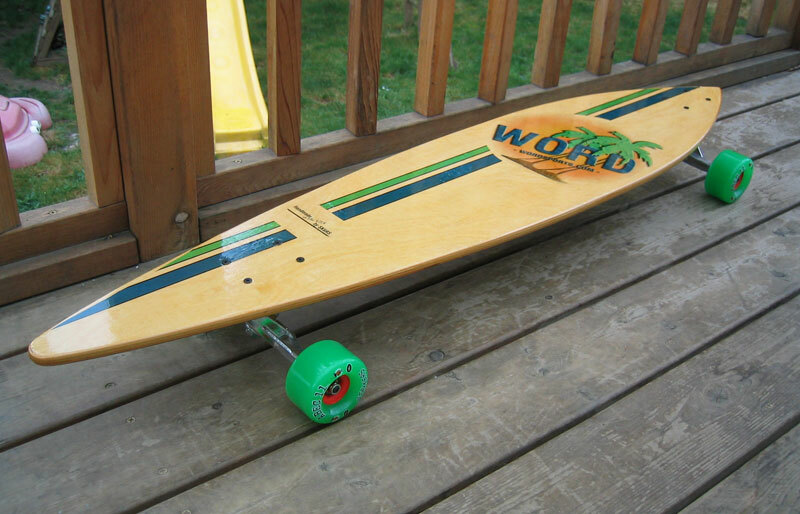 Wheelbase and board length long enough for that smooth longboard cruising feel, yet short enough for around town maneuverability. 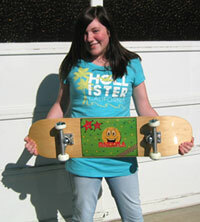 Sold as deck only, or complete with Randall II 180 trucks, Abec 11 Flashback wheels, Biltin bearings, hardware & grip. 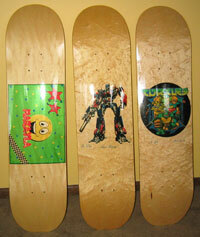 Options available: Seismic Aluminum 180 trucks, and other Abec 11 wheels (Grippins, Gumballs, Strikers, or Flywheels). Length 40", Width 9", Wheelbase 31.5" (axle to axle). Designed for high speed downhill cruising. 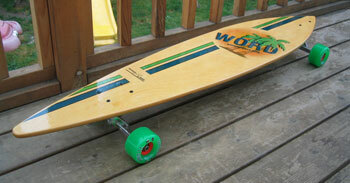 Current test models designed for riders 185 lbs or less -- 1/2" 9-ply Baltic Birch wood. 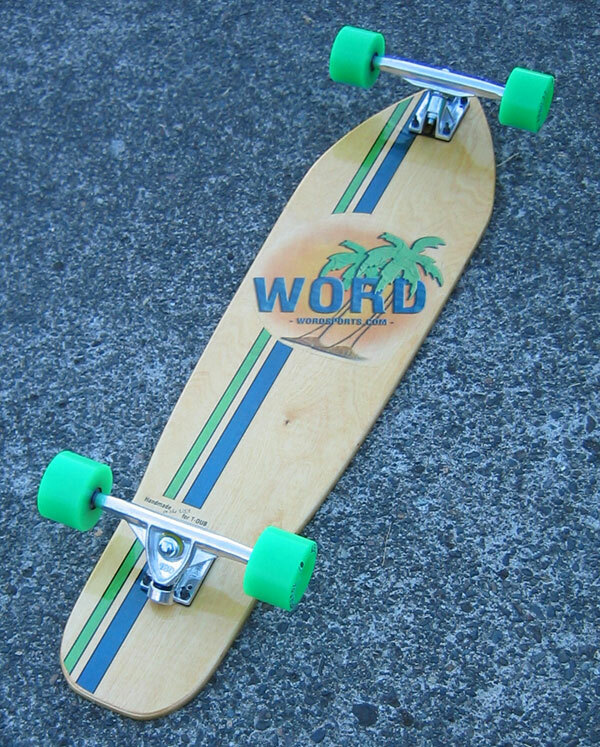 A slightly thicker 11-ply Baltic Birch wood will be used for riders over 185 lbs. 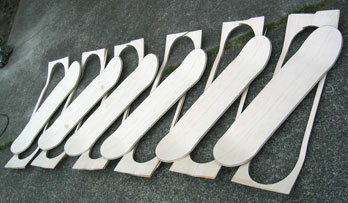 The Baltic Birch wood boards have a moderate or medium flex. The flex is great for smooth cruising, carving, and giant slalom. 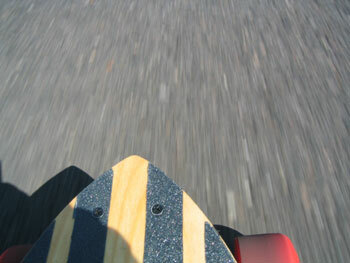 For downhill racers we will be testing some Maple wood boards for a stiffer high speed performance deck.